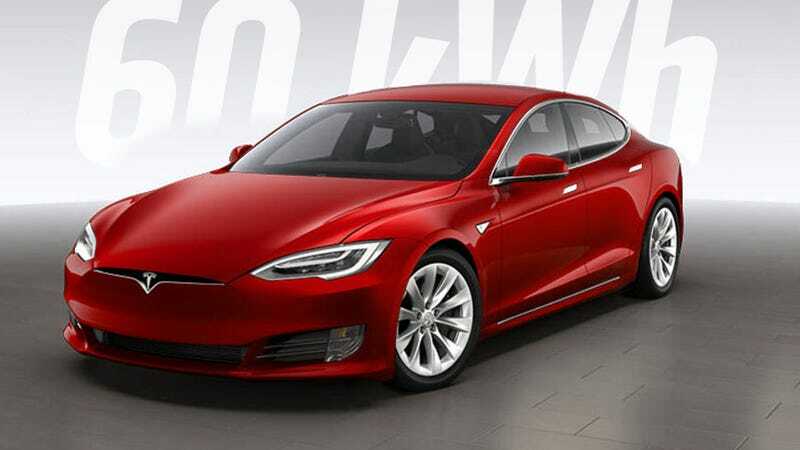 Way, way back, in a glorious old year known as 2015, in an era when people were fascinated by ambiguous dress colors, Tesla sold a car known as the Tesla Model S 60. The Model S 60 has been gone for some time, leaving the most Americans miserable, broken husks. Until now. The Model S with a 60 kWh battery pack is back, and it’s only $66,000. The original Model S, which those of you over one year old may remember, started at right under $70,000, so this new one is a nice chunk cheaper, and likely a sort of entry-level stopgap model until the Model 3 is ready. The Model S 60 will get to 60 MPH in 5.5 seconds and have a range of 210 miles, and a 60D model (starting at $71,000), with dual motors for AWD is available as well, with greater range and acceleration. To provide customers even more flexibility over time, Model S 60 and 60D owners may later choose to upgrade their vehicles to a 75kWh battery with a software update, should they want to add to their car’s battery capacity in the future. So, this means that it’s just software that’s artificially crippling the 75 kWh battery to be only 60 kWh. If you buy a 60, then, you’re hauling around 15 kWh of heavy battery that you can’t use, which has to affect range in somewhat. On one hand, it’s pretty remarkable to have a car that can increase its effective range by just having a key of ones and zeroes beamed to it, but at the same time, it’s a little maddening because you’d be dragging around all that unused potential until you did it. I get why Tesla chose to do it this way—it makes a new entry-level model with no real hardware changes—but the idea of crippling the car via software just still makes me feel funny, deep down. Anyway, it’s a Model S for almost six grand cheaper than before. Maybe you can kick some of that to an Estonian hacker who can figure out how to unlock the full potential of the battery.